Alejandro Tearney has been an artist for over 20 years, in that time always exploring new ways of creating and visualising work. 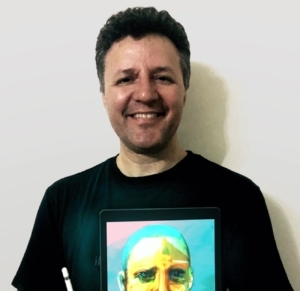 His passion for art encompasses painting, drawing, printmaking and computer generated art and passing these skills on to students and other artists alike. Today, Alejandro paints on a digital canvas creating rich and complex images by manipulating and layering traditional media with digital forms. Alejandro has studied art in both the USA and Florence, Italy and holds a Masters in Fine Art from San Francisco Art Institute. © 2019 Fremantle Arts Centre.